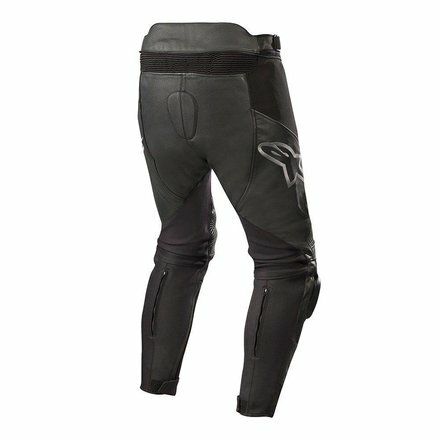 Very competitively priced newest leather sporty Alpinestars pants. The CE-certified SP-X pants are made up of a multi-material full grain leather frame and an extended stretch fabric for excellent fit and movement. An extended waist at the back, a reinforced seat and an internal body-mapping mesh lining means that it offers adequate protection, comfort and durability. • Supplied with Alpinestars' leading CE-certified Nucleon KR-H hip protectors, which contain advanced PU foam for impact and abrasion resistance and are ergonomically designed. • Internal CE-certified Alpinestars GP-R protection on the knees. Protectors are anatomically profiled and provided with shock-absorbing EPU foam for fit and comfort. • Replaceable kneesliders for sports and for excellent impact and abrasion resistance. • This garment is CE-certified 89/686 / EEC. • Waist circumference setting for personal fit and comfort. • Waist connection zipper ensures attachment to Alpinestars jackets. • Local perforation for excellent ventilation and internal airflow. • Velcro closure for the ankle ensures that the pants remain stable on the lower leg. • Internally reinforced seat for comfort, durability and protection.